Most of Spain follows two religions: Catholicism and Fútbol! Recently held was El Clásico, the ultimate soccer match between Real Madrid and Barcelona. This match is the equivalent of the United States Superbowl, complete with intensely loyal fans, advertisements galore, and houses and bars full of people glued to the screen. In fact, nightlife throughout the streets of Spain is active, loud, and constant except for this sacred night. The streets were barren as everyone was inside watching the game. Though study abroad is all about trying new things and experiencing that which you have not and perhaps will not ever have the chance to experience again, I also think that studying abroad is an important time to discover aspects of one’s life that, regardless of the situation, do and ought to persist. Such an aspect for me is music. Even before finalizing my study abroad plans to Granada, I made an unofficial vow that I would find a choir in which I could participate. Though finding one and working through scheduling conflicts was certainly not easy, success! I am part of the Coro de la Facultad de Ciencias, or the University of Sciences Choir. I am delighted to be a part of this group, about which I will tell you more in the micro-bio below. Back to soccer. My choir director invited the entire choir and other friends to his house to socialize, eat, and watch the game. What fun it was! 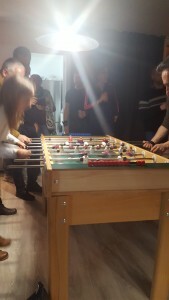 I spent the evening in a cool basement decked out with pool and foosball tables, ping pong, funky seating, and tons of food. This event confirmed several Spanish cultural norms: I arrived just under an hour late and was still the fourth person there; everyone else trickled in after an hour and a half to two hours! When anyone entered the space, he or she said hello to everyone with an hola and two kiss es on the cheeks or a handshake and hug. My favorite aspect of the night was getting to converse with a variety of people. I had a long and lovely conversation with an older woman and member of the choir who very flatteringly told me that I speak well! (This is the ultimate compliment for a study abroad student.) I also made friends with Alicia, a 20-year-old student at the Universidad de Granada who is studying to be a dentist. She was very engaging and fun; we spent the majority of the time vacillating between being heavily involved in the game and snickering at those far more involved than we were. I swear the very life of Joaquin (a fellow choir member) depended upon this game! Thankfully he survived as Real Madrid, the favored team by most Granadinos, won! The game was exciting; Barcelona scored first after an intense first 80 minutes. In the second half Real Madrid scored and the whole basement shook with applause! Later Real Madrid scored again but the referees did not count the goal for some particular reason. Filled with renewed vigor and some frustration, Real Madrid scored (again) within two minutes. ¡¡¡¡GOOOOLLLL!!!! 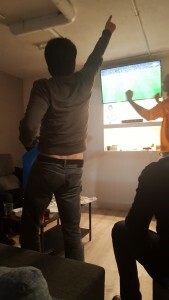 (I managed to capture the moment of triumph on audio when Madrid scored!) After the match, the rest of the night was filled with food, friends, games, and singing. I think it is impossible to have a group of musicians (especially choristers) gather and not sing at some point! So, shortly after the Real Madrid victory, we sang a fun French number, Tourdion. All in all I felt included and engaged in an authentic Spanish experience if ever there were such a thing. 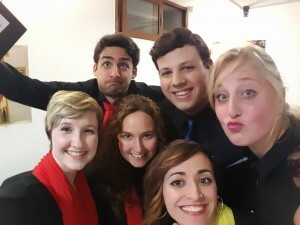 Micro-Bio: My choir 🙂 El Coro de la Facultad de las Ciencias is a group of roughly 50 students, faculty, and staff of the Granada Sciences department. I love that despite a diversity of backgrounds, interests, personalities, and ages, they as a group are united in a mutual love of creating beautiful music. What they may lack in perfect blend they make up for in passion. For example, the Chapel Choir sang Amor de mi Alma by Randall Stroope (and a poem originally by Luis de Gongora, a very famous Spanish poet). While the Chapel Choir sang it with such extraordinary beauty and blend, there is something extra added when the song is sung by native Spanish speakers. The director, Paco, did not need to teach musical emphasis for various words because the choir felt the words already. It was beautiful. A few members I know particularly well are Cristina, Immaculada, Clara, Albert, Angel, and Salva. They are some of the students of the university with whom I go out for tapas after choir on Thursdays. Though they are the most difficult to understand (slang and heavy accents!) they are so much fun! I have also become good friends with Jane, a woman originally from London who moved to Spain. We enjoy the mental break of getting to speak in English or Spanglish with each other. Like most musical groups, this choir has become like family. I have learned so much, sung some of my favorite choir pieces, and met wonderful humans. We are touring to Valencia soon, so more to come!